The Louie family have been running Seattle restaurants since the 1930s, and this one seems to serve the bland form of Chinese food that is popular with elderly white people. But the elaborate decor and old school bar make it worth a visit. In a previous post I opined that lounges attached to Chinese restaurants are widely bifurcated into "classic" types and "slipshod" types. 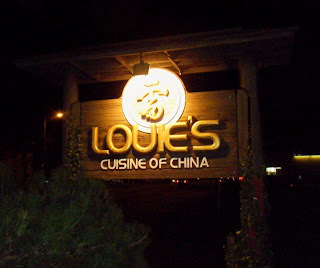 The lounge at Louie's Cuisine of China was recommended as a good classic type. And indeed it is, with a very nice decor, though with a curiously limited set of baseball memorabilia somewhat conflicting with the theme, a limited, standard bar menu, and a nice little set of regulars. The latter, on the Saturday afternoon I dropped by, including a 60-ish man with a white mohawk, and a large guy in a Hawaiian shirt who brought his prized meatloaf in thinking it was meatloaf contest night. "I worked all day on that," the guy said, "Look at my presentation!" It turns out that the meatloaf contest is next Sunday.